With the straight single-grip snaths of the “Eastern” cultures, all of this is less of a problem because it is a more “forgiving” basic design. Although it too could use slight refinement, it is adequately functional as is. I am here primarily concerned with the two-grip models which are often sold with the prefix “Austrian” or “European” style snaths — usually (but not exclusively) via mail order. A large percentage of the new buyers are novices who initially need all the help they can get. Although an ergonomic snath is only part of the success equation, it alone goes a long way in contributing to a positive experience. 2. The ergonomy of practically all commercially produced snaths can be improved individually by their users, in many instances considerably so. I’m not merely concerned with the potential pleasure derived from mowing with a good scythe; ergonomy also equals efficiency. 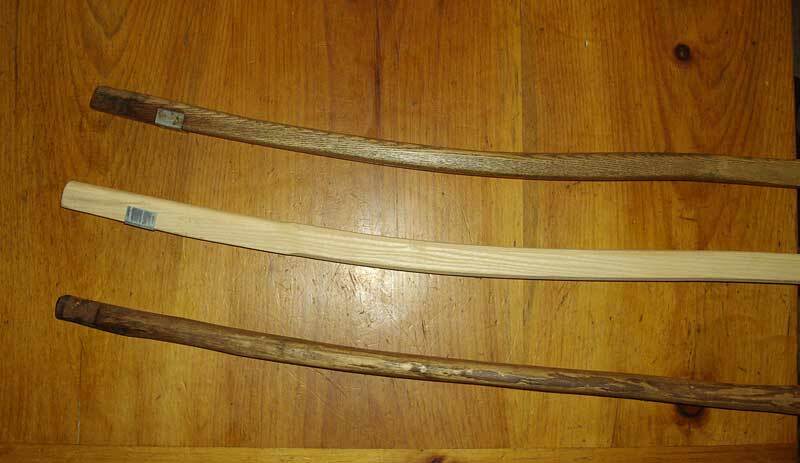 On numerous occasions during courses (when I let people try out my scythes), individuals or groups ask me, “What is it about your scythes that makes them so much easier to mow with?” Mostly they are not talking about sharpness but rather “handling properties”. So there are these total beginners using my 80-95cm blades and making a better job of it, than with their newly purchased 60cm or 70cm ones. What indeed is the difference? 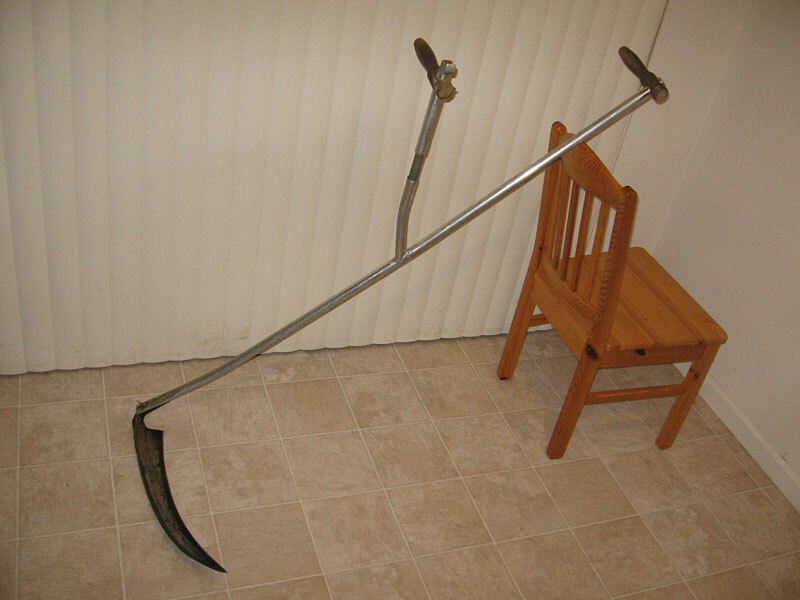 Well, there is no magic involved; my scythes are just more ergonomic. By this I mean that the blade is “in sync” with the snath which in turn meets the human body’s subtle desire for comfort while performing a task like mowing. However, many of you already have snaths. Poorly designed as they may be, retrofitting them will take you through the first stage of understanding how to make new ones. It will not be a ten-minute job and I hope you do not calculate the value of time spent fine-tuning your working tools in terms of dollars. The benefits will be well worth it. Although the guidelines below focus on snaths sold by North American retailers, the principles are applicable universally — to either retrofitting other models or making new ones. and, in small numbers, the most recent Austrian-designed Swiss-made model. 1. 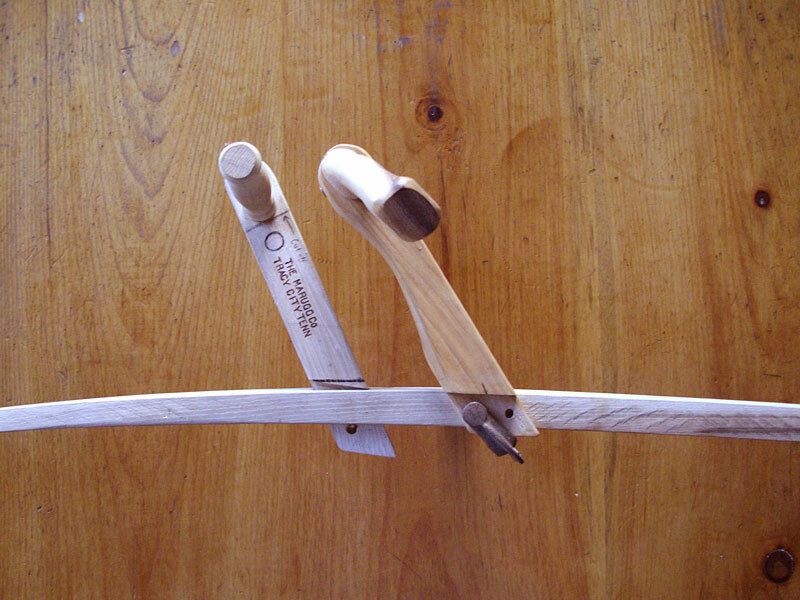 Improving the ergonomics of a snath per se does not guarantee snath/blade harmony. Fitting a blade to it is yet another issue. However, altering the snath design itself you have nothing to lose. As it is, many of your snath/blade combinations are not well matched. Once you have a relatively good snath, you can follow instructions on how to fit a blade to it. For instances of probable fit and misfit of some specific blade models sold with the snaths we are about to retrofit below refer to Re-tuning your scythe. 2.While retrofitting any of the models, the two final objectives — custom sizing the snath and improving ergonomic features — should be considered simultaneously. Therefore the first step should be to assess the fit of your present scythe according to guidelines in Sizing the Snath. I urge you to do this even if what you purchased was supposed to be a “custom-sized” snath. Also, the range of grip adjustability on the so-called “adjustable” models have limits. A considerable percentage of such snaths do not fit their owners well. 3. Without appropriate grips, a snath does not deserve the prefix “ergonomic”. Thus I am going to suggest that the grips on most of your originals (the new Swiss model is an exception) follow the trail of the dinosaur. The last good use they can be put to is that during the initial sizing you note if they are presently on the recommended marks. If not, record the differences so that you know with some certainty where exactly to attach the new ones (especially if it is to be a snath with fixed grips). This Tennessee-made snath has likely been sold in the USA for longer than any other of the European style models. But to keep using it as-is, just because of its Swiss heritage and it being sold “all over the world for 130 years”, is somewhat like insisting that we should keep driving the gas-guzzling USA-made Fords and Chevrolets because they once fit the international image of a good automobile. At this point in history efficiency matters, and neither those cars nor the Marugg snaths meet that paradigm. 1. 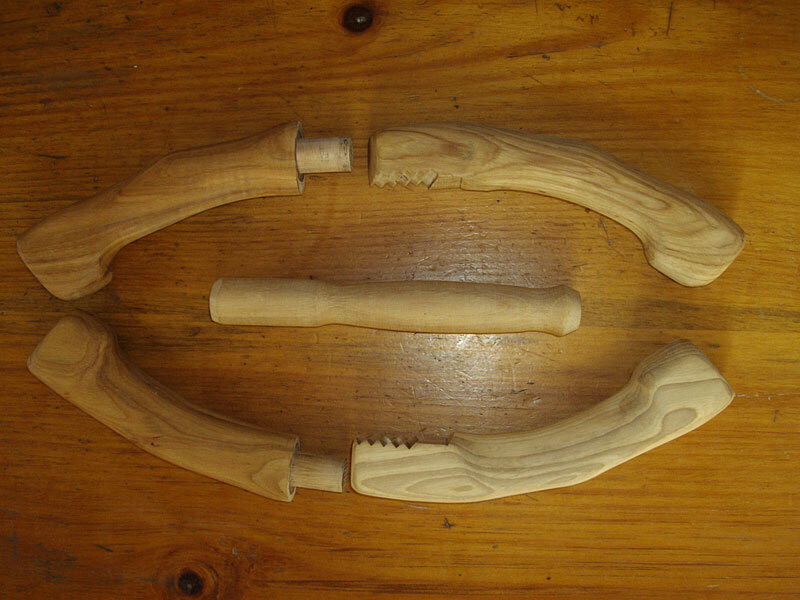 Because the small round pegs now masquerading as grips offer no opportunity for alteration, detach both of them. Diagram 1. Click for a full-size image. Please see also: Snath dimensions at respective points regarding the diagram above. it provides an attachment place for a variety of other grips. it gives the snath the kind of balance most of you have not experienced and practically all of you will appreciate. Every other commercial snath of the two-grip design would, in my opinion, benefit by the addition of at leastsome weight in that place. The heavier the blade used, the more this is true. The Marugg model is among those which cry for this alteration, because the top half is so disproportionately light in relation to the heft of the bottom half. Besides, Marugg’s blades are rather heavy in relation to the kind of light Austrian models that once earned them their good reputation (and which the Swiss were likely using at the time they designed the forerunner of the Marugg snath). 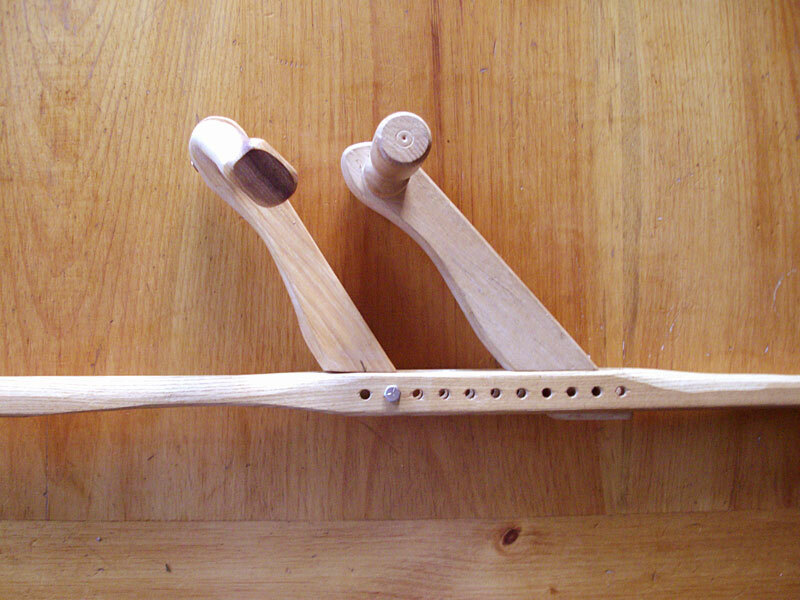 1a and 1b: close-up of ergonomic upper grips, with Marugg’s “peg” in the centre. 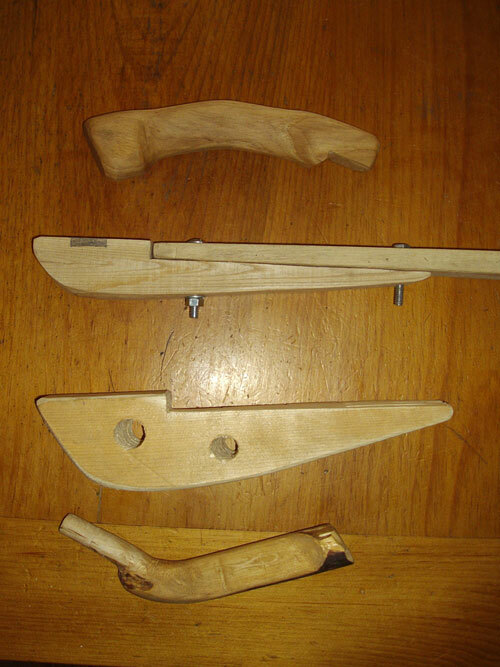 1c: Lower and upper ergonomic grips framing Marugg’s and Scythe Supply’s in the centre. 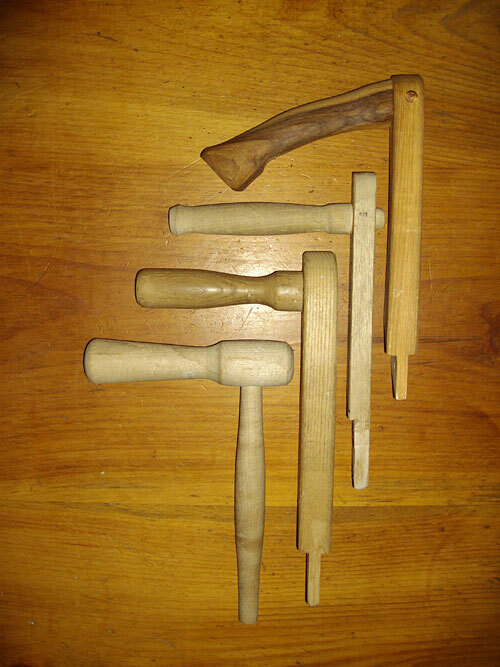 Photo 1d: from top to bottom, Canadian, Marugg, Green River and Scythe Supply. Photo 1e: Side view of same, in opposite order. Back to the retrofit process at hand. With the added “balancer” you have more attachment options for the upper grip than this snath had before. 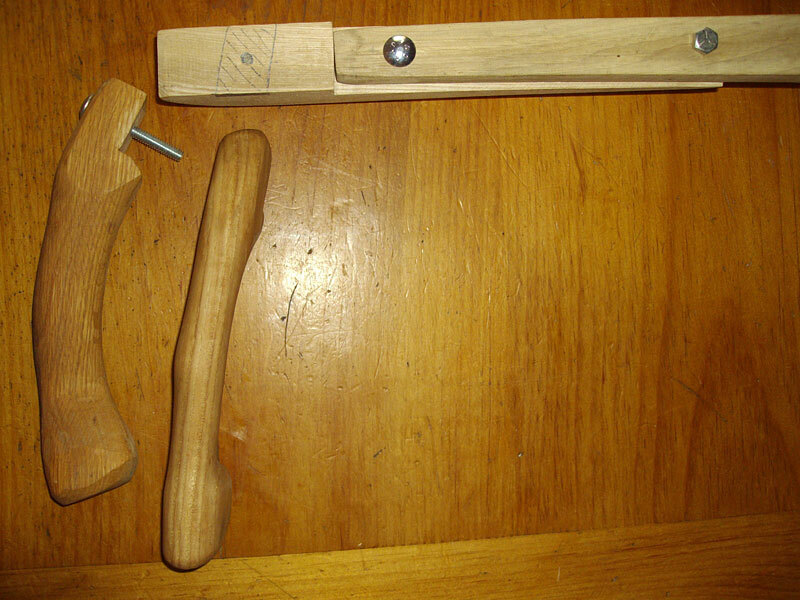 The two simplest ones are a notch from the top or a round hole from the side. Both grips can be self-made, either from sawn lumber or a piece of tree branch. 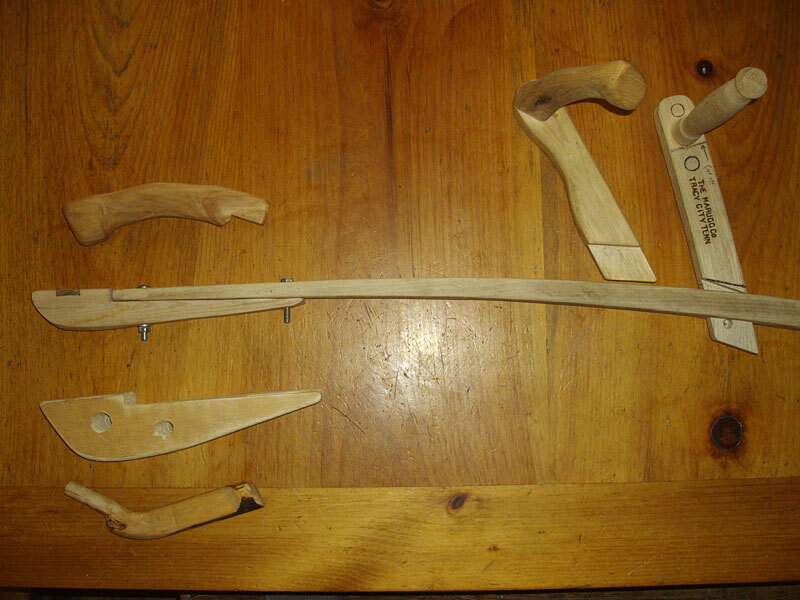 Photos 2e and 2f — the initial homemade prototype of the upper grip with Marugg’s and Scythe Supply’s in the centre and a wildwood grip above. 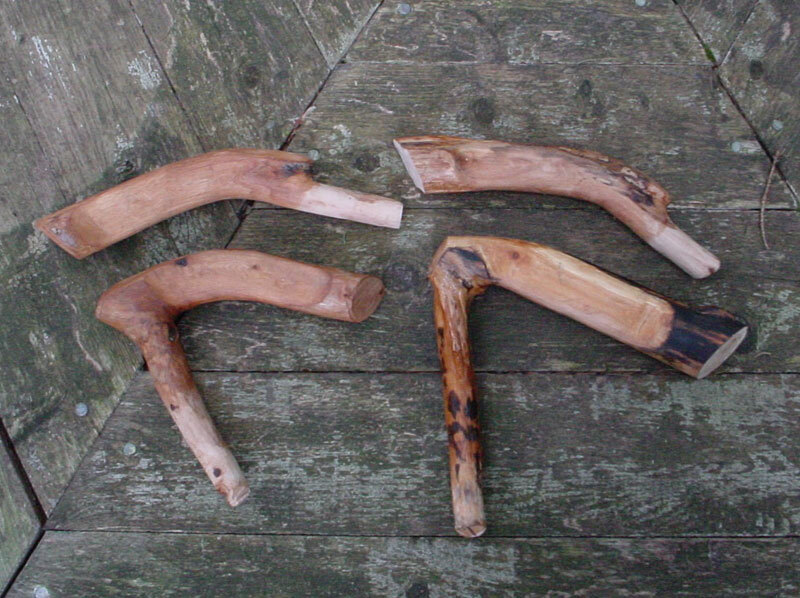 2f Two matching pairs of wildwood grips. Photos 2g, 2h, 2i — Attempt to show differences between original and improved lower grips as they should be angled once fitted to the shaft. 4. Now follow the guidelines for retrofitting Marugg’s snath. Figure 3a above shows the balancer attached to the former blade-end of Scythe Supply’s snath. b) if I also intend to use it with a relatively light blade (450g. or less) –in which case I would thin down the blade end to at least the dimensions suggested in Diagram 1. In any case, that bend previously near the bottom end of your original will now have more merit than it had before. Namely, it allows you to use a shorter stem for the lower grip than a straight-shaft snath requires. This, by the way, is the only reason why anyone should design and then trouble themselves to make a curved snath. 5. Determine the place for the lower (right hand) grip. If you are not taller than 5′ 8″ to 5′ 10″ I suggest using about a 5″ to 6″ stem for the field mowing version and 7″ stem for a trimming one. If you are taller, add an inch to each, if very tall add 2″. If retrofitting the straight version, — and provided the grips are now placed where you want them — you have the option of saving the original lower (right hand) grip’s “stem”. 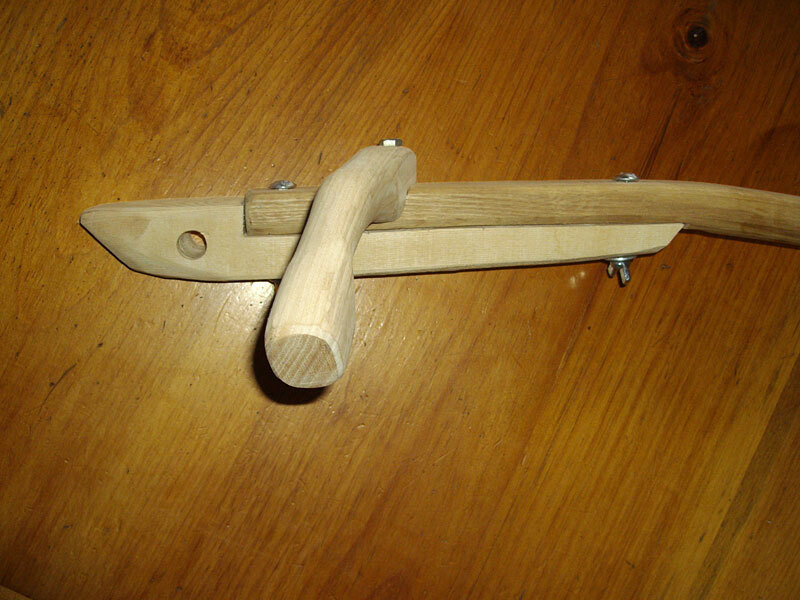 Make a better grip and attach it to the existing stem. 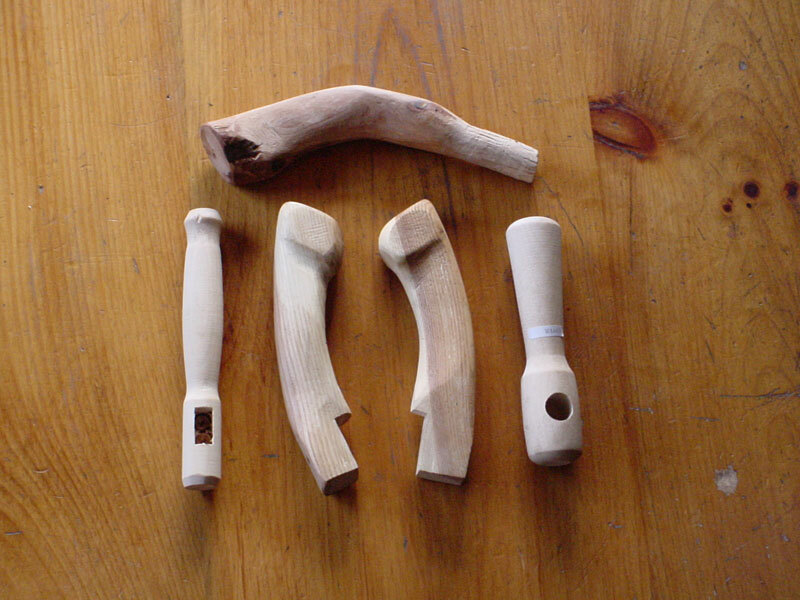 (If it is to be well done, you may actually find it more difficult than finding a complete wildwood grip/stem piece from a branch — see photos). Should you choose this option, shape the grip somewhat like those in series 2, in the Marugg section above. Place it into the same (re-drilled) hole as the original, or exactly where you want it, and at a better angle than the original stem. 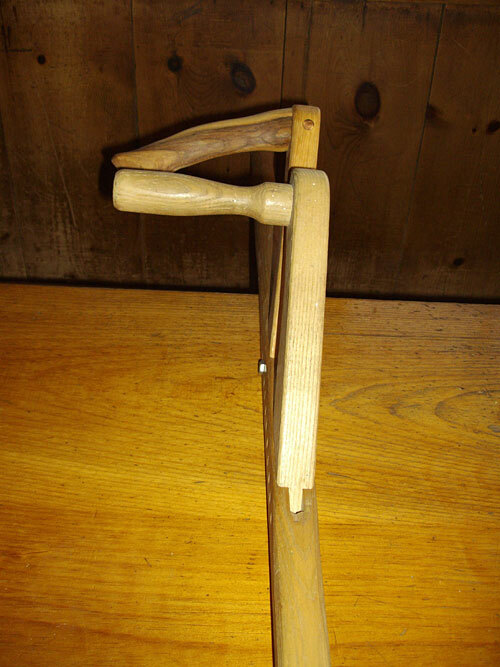 Although this model is sold as “adjustable”, it imposes decidedly person-size limitations. Therefore, only if, after sizing the snath, you determine that the lower grip’s uppermost position will reach at least your hip joint, may it be worth your energy to proceed with the suggestions below. The owners of the Lee Valley version who are over 5’6″ tall and of the snath from Johnny’s who are over 6′ tall would do better to start from scratch and make a more convivial wooden snath. That, in any case, is my opinion. However, this is what one very tall man came up with as an alternative “solution”. 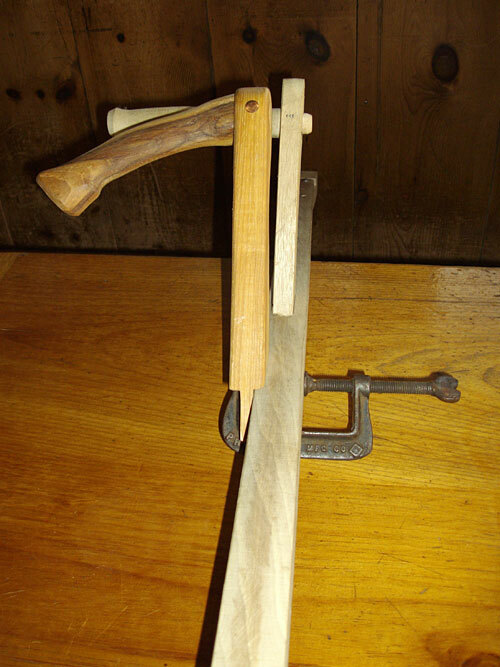 I still maintain that he is satisfied with it only because he has not tried anything better… That snath may behave as if it was longer because he can now reach the right hand grip without bending over — but the extra long stem on it is a very wrist-unfriendly arrangement. For trimming a few “weeds” in the yard it may do — so if that’s all you obtained a scythe for, by all means, try this option. 1. For an actual design alteration make an “improved duplicate” of the lower grip — one with the hole drilled at the more ergonomy-inducing angle discussed above. 2. Because with this snath’s round aluminum shaft both grips can be rotated around the respective places they are attached to, the upper one can also be positioned to match the 5-10 degree drop in the new lower grip’sbetter attachment angle. 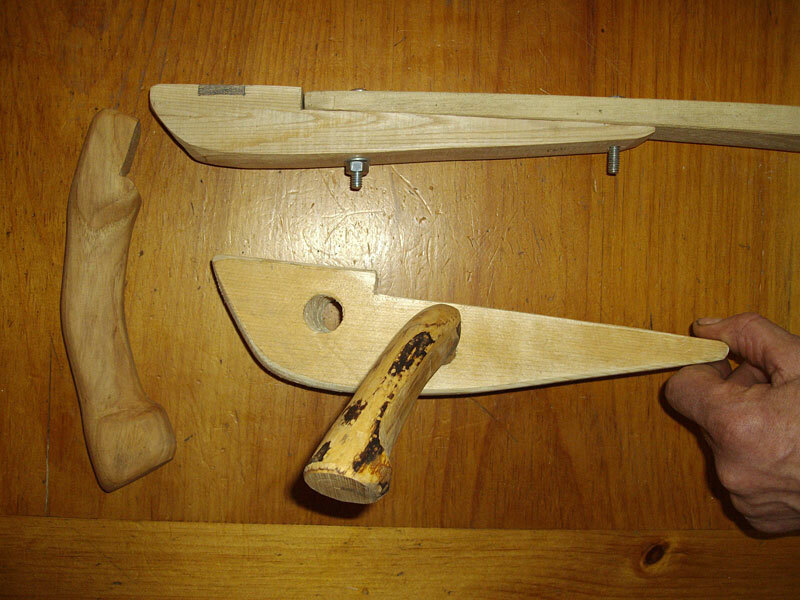 So just flattening the inside of it (the upper grip) may be enough of an alteration to begin with. 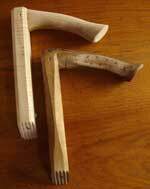 Then — provided you shaped the new lower grip as it ought to be — you will note the difference in how they each fit your hand. Should you appreciate that difference, make also a new upper grip. If you do, drill its hole on such an angle that, once mounted, it will point 10 degrees away from the lower grip (as suggested in the outlines for altering Scythe Supply’s and Marugg’s snath above). To improve the overall balance you can remove the plastic cap at the snath’s upper end and insert a piece of solid steel rod weighing between 2 oz/55g (Lee Valley model, short people) and 6 oz/170g ( Johnny’s Selected Seeds, tall people). The scythe mail order company founded by David Tresemer — the author of The Scythe Book — sold hundreds of what we’ll here refer to as “Green River” snaths. 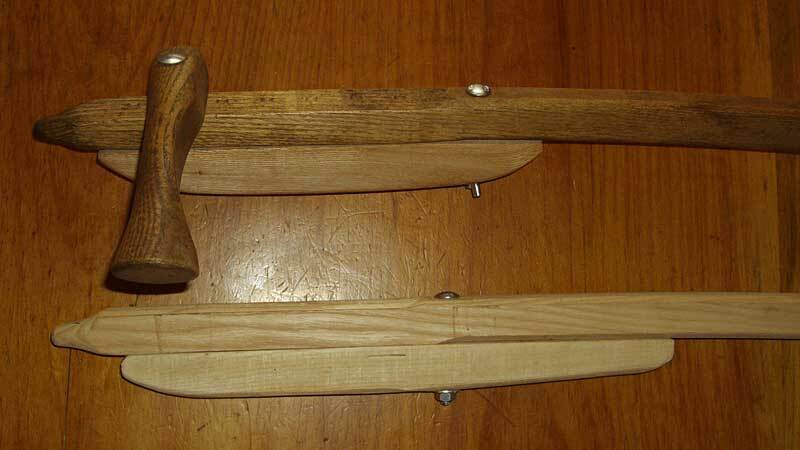 They can also be called “Smith and Hawken” snath because when Green River Tools quit, Smith and Hawken copied the design and continued to sell it until the mid 1990s. But, as explained in The Scythe Book, the snath was designed by David Tresemer himself. 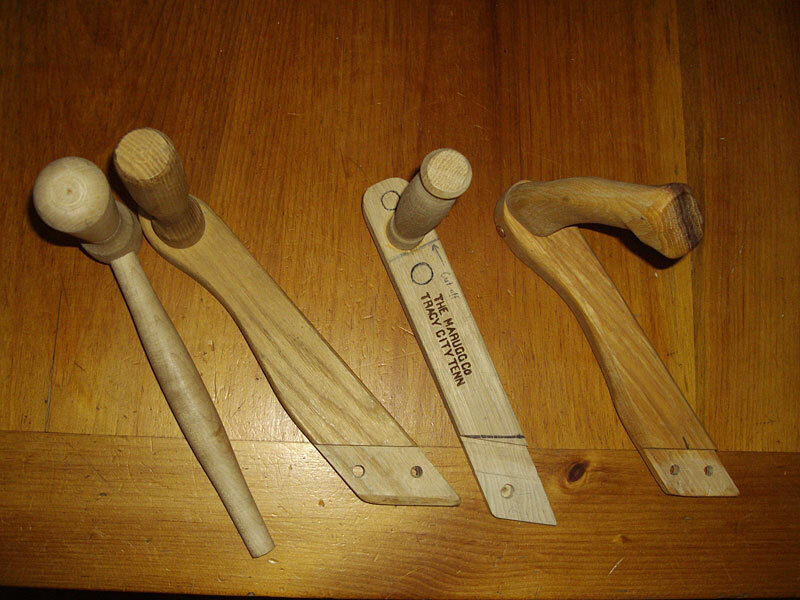 Still a relative greenhorn at the time, he was unfortunately influenced by the prevalent (and for the most part ergonomy-lacking) designs. 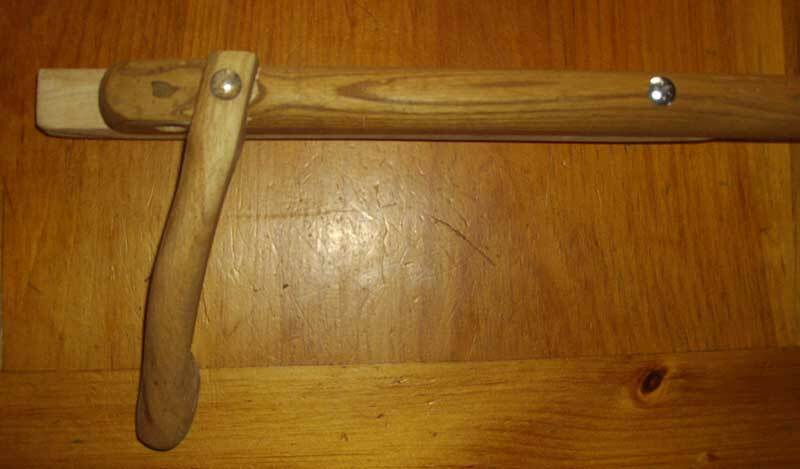 However, concerning materials and woodworking precision these were well made snaths — and many of them are still out there being swung… Nobody who originally purchased one should claim it to be too short because the company sent them out with the shaft long enough for a 6’4″ person. New owners were supposed to cut them down in length “as needed” (from the bottom end, of course). Well, from the existing examples we’ve seen, it appears that nearly everyone was too cautious to cut enough off. A logical approach, I suppose, since you can’t later add it back. Consequently most of these were left on the long side, too long if you mostly “trim weeds” in any case. The lower grip is adjustable though the upper one is fixed — which reduces the customizing potential by sometimes a significant margin. My advice is to dispose of both of those grips, because they are as poorly shaped and angled as those on the rest of the models already discussed — and outfit this snath with an upper grip which is also adjustable. 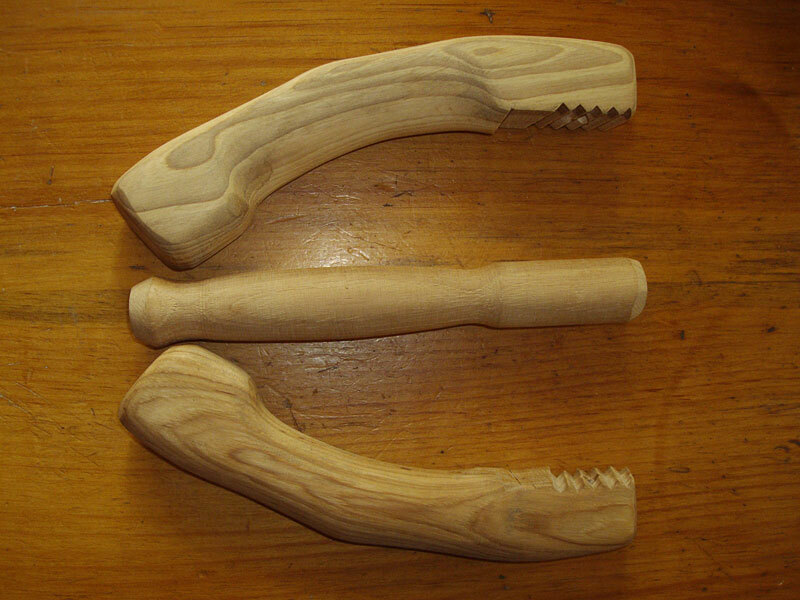 The first production run (of 500) was “unintentionally” made without the downward (from horizontal) sloping grips. Although (as one of the co-designers) I protested, they made it to market in Germany and the UK with the promise that the next batch will be right. At least two Americans I know of (because they came to our scythe course in Canada) had ordered this model from across the ocean and received one from that first batch. If I were one of the recipients of one of them, I would at this point pay the extra money and ask my supplier to order me a replacement set of grips. 1. 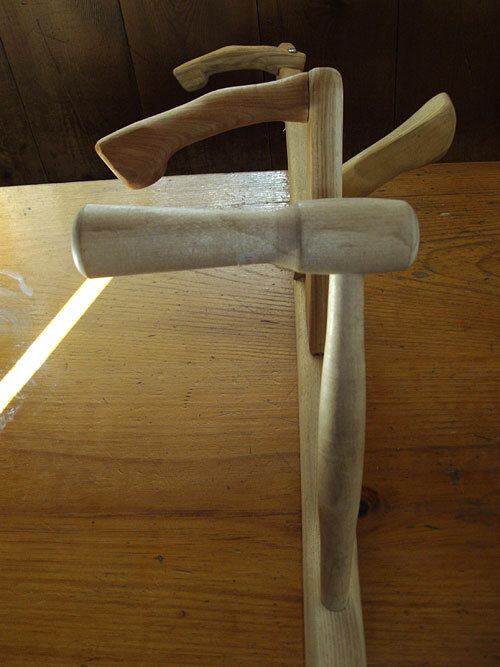 I reduced the bottom one-third or so of the main shaft by a small amount of weight. b) The direction of the wood’s grain in that individual snath. 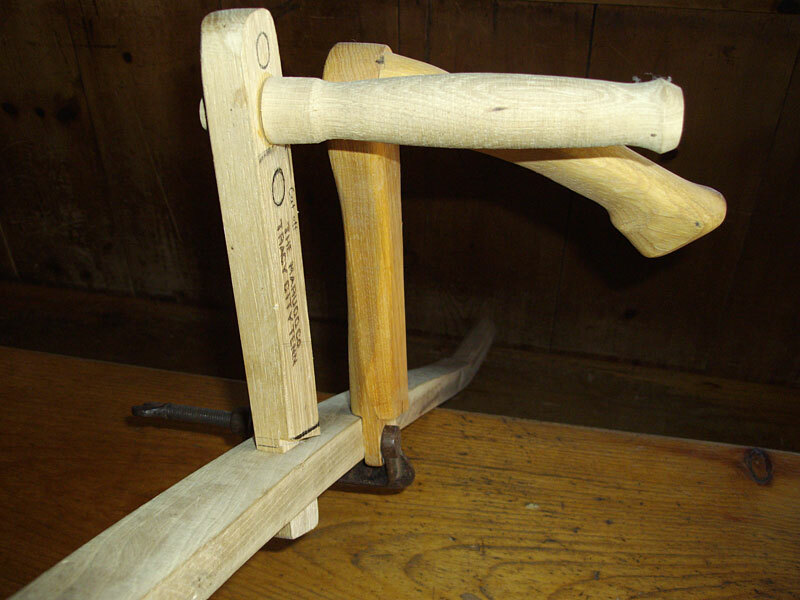 This curved snath, you see, is not steam bent, but rather cut with a band saw out of a plank — and it would be impossible to have them all with uniform grain. The average of them, however, can tolerate at least some “lightening up”, in my opinion. Photo 6a shows an example of the wood reduction. In the centre is the Swiss snath original; at the top my own refined version of it; at bottom (for reference) is one of Ashley’s snaths. I left the width of the original as it was i.e. 30 mm and only reduced the thickness. In approximate reference to respective points in Diagram 1, point A of the Swiss snath was thinned to 25mm, point B to 23mm and point C to 28mm. 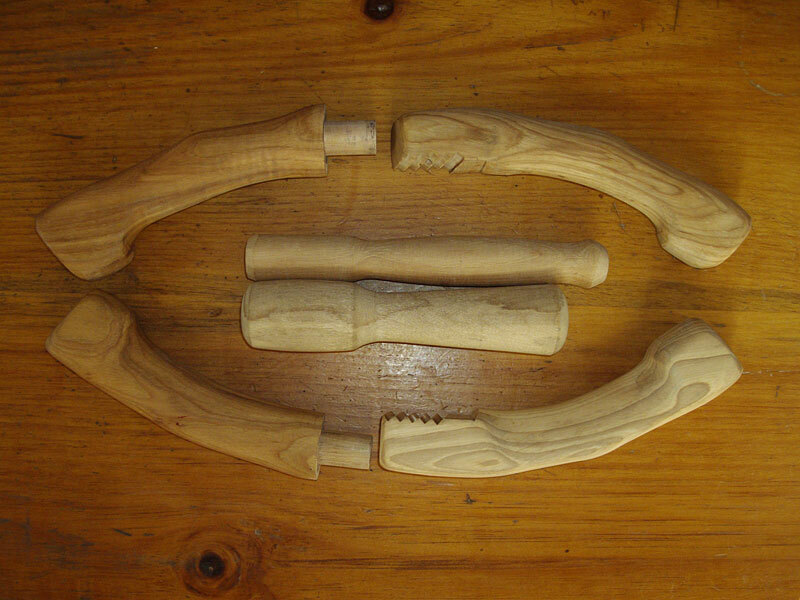 Ashley’s snath (made from a birch sapling of about the same dimension as you now see it) is slightly more round so has even less wood than my altered Swiss model (plus ash wood is stronger than birch). She has used this snath, without the reinforcing snath saver, rather extensively for three seasons, always with a light 85cm blade and not just to play around with. 2. 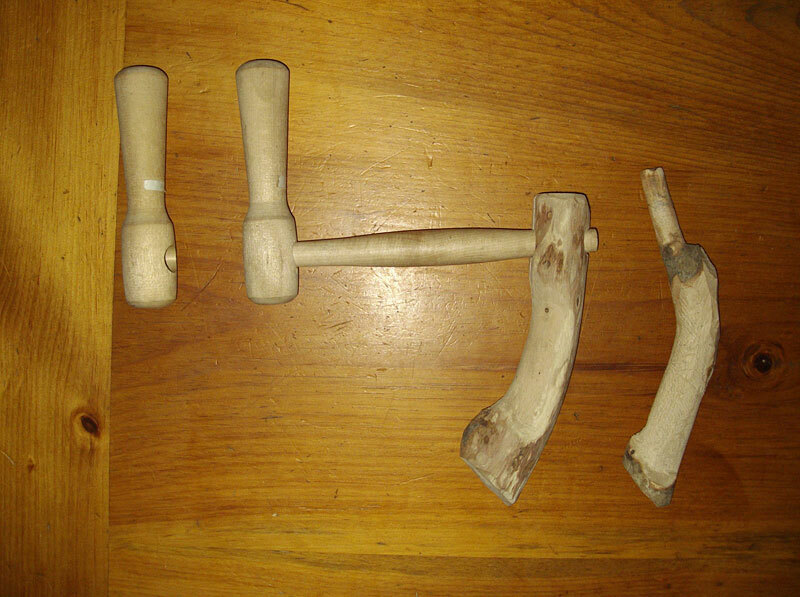 I reshaped the grips slightly. (photo 6b). They are not large enough to begin with so cannot be endowed with a shape quite to my liking, but these alterations make them better. 3. The third touch, which I haven’t presented for field tests in Europe but know is an improvement, is adding the “balancer” (photo 6c). Because it is such a simple matter to make one and experiment with different weights (100-200 g, depending on the weight of the blade) you would be a fool not to try it.